Here is another round up of recent news straight from the LPU HQ. In this round-up we have news related to LPU chat, LPU Early entry for European shows, an LPU survey plus more! If you have not had a chance to read up on the latest news, do it now! This year marks 15 years of the Linkin Park Underground. That’s right, 15 years!! Make you feel old? Makes me feel old! The guys over at the LPU HQ have asked fans to complete a survey. Our input will help shape the next version of the LPU (supposedly LPU XV). Simply click here to access the survey. Please submit your responses by September 10, 2015. Please note: Your input is very important to us and will be kept confidential. We estimate that this survey will take you approximately 5-10 minutes to complete. If you have any questions please contact us at LPUHQ@LPUnderground.com If you have already done so via email, please do not do the survey again. Head to LinkinPark.com/EarlyEntry on the day of each show for specific Early Entry details. Details for the Linkin Park show in Poland on 8/25 is available now. LPU HQ is looking for volunteers to help out at the Linkin Park shows in Rybnik, Minsk, Moscow, Jamsa, and Berlin on The Hunting Party Tour. Click here to sign-up for the shows you want to volunteer for. Find out how to access VyRT as an LPU member here. MORE: The LPU appear to be changing the way band chats are conducted. This time around they are collecting questions to be answered by Joe prior to the chat session. To submit a question, please click here. 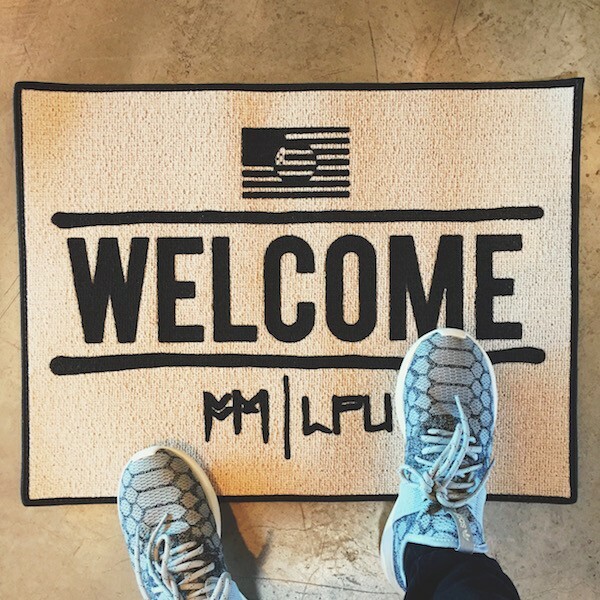 Would you like to own a Fort Minor ‘Welcome’ mat? or custom LPU sticker designed by the one and only, Mike? That’s a no-brainer right?! Head on over to the LPU store right now to get your hands on one! These are limited edition so once they are gone, they are gone! Would you like a chance to win a photo pass at one of the upcoming Linkin Park shows? Click here to see how. This entry was posted in Blog, LP Underground, LPU Chats, LPU Meet Ups, LPU News, News, Theme Relevant, Uncategorized and tag linkin park, lpu, the hunting party tour.